Whether you're in the street, riding the train, out for a jog, or wherever, you're bound to see people with those little earbuds that mean they're listening to their iPod. Everyone from President Bush to British Prime Minister Tony Blair to Queen Elizabeth has one. Difficult as it may be to fathom, it was only five years ago that Apple, long known as a cutting-edge computer company, launched a product that enabled people to carry their entire music collections in their pockets. The easily-navigated personal jukebox transformed the way people listen to music. Now, there are roughly 70 million of them out there. And Newsweek Senior Editor Steven Levy takes note of what he calls the world-changing cultural phenomenon they've become in his new book, "The Perfect Thing: How the iPod Shuffles Commerce, Culture, and Coolness." On The Early Show Monday, Levy asserted to co-anchor Harry Smith that iPods have helped people rediscover music, and have changed our behavior and our society. Levy says the iPod has become "the poster child" for the 21st century, and it reveals a lot about a person. iPods came out less than two months after 9/11, so Apple was worried about how well they would be received. Now, they're referred to as "the Walkman for the 21st century." CBS News technology analyst Larry Magid discusses the iPod's impact with author Steven Levy. 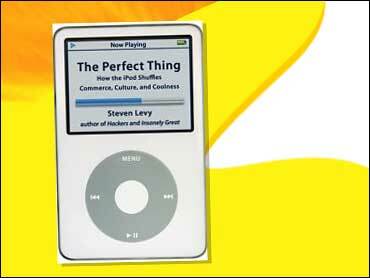 Levy calls the iPod "the perfect thing," explaining it's not perfect in the sense of being flawless, because there are gripes about it. But, he adds, it's "the perfect storm. It's a device that solved a problem just at the right time where it could change our lives and it did it so well. It's a breakthrough consumer electronic product and it had ripples throughout our culture. It was the right company (Apple) and the right technology and the right environment." Why did it take hold the way it did? The people who got it first were passionate about it, Levy says, and people love music, so it was something that could deliver more of an emotional tie. And it's "so darn attractive. People had a relationship with it and the music was amplified by how fun it was to hold. It was a new way to get and listen to music." Levy goes so far as to call the iPod "a synonym for a great product: 'This is the iPod of the Apple.' "
"Obviously," he says, "the iPod was a great breakthrough in that you could have your whole music library on this tiny device. When you shuffle, which reorders songs like a deck of cards, it's an amazing way to rediscover music. By pulling different kinds of music, it's like DJ connections that are magical. This is the theme of the digital age." IPods are very revealing, Levy says: "When you hand over your iPod to someone, he or she enters your world. It reveals your passions, your bread and butter, your guilty pleasures. You can learn a lot about a person by putting your head in their earbuds." As for the complaints about iPods, Levy points out that, for awhile, it had battery problems, but Apple has fixed them now. Some worry that earbuds piping music directly into the ear may be harmful. And the biggest gripe Levy hears is that the songs you buy on iTunes, Apple's music store, can't be played on software systems other than the iPod. And, while serious competitors are beginning to emerge, Levy says, "I think it's at its peak. … Right now, it's the king." iPods changed Apple, Levy told Smith, "from a company with a niche market share with a really nice compauter to a company with massive market share in an incredibly important new product category. ... (iPods are giving the) halo effect," driving more people to buy Apple computers. To read an excerpt of "The Perfect Thing," click here.